CashStar is a pre-paid eCard software for businesses and organizations. The company has been growing fast. Clients have been seeing growth as a result of using the platform. Companies use pre-paid eCards to attract new customers. People can buy the cards as gifts or they can use them on their own if they would like. An example would be Subway, the popular fast food restaurant. It’s a popular gift to get someone a gift card so they can enjoy a few sandwiches. With GiftStar, people can buy the gifts and have the “card” sent to the recipient even on their smartphone. It’s fast. It’s simple and it grows business. So it’s an interesting company and today we’re going to look at what they’re doing with their blog strategy. We’ll talk about it since CashStar has their archives in the sidebar. You can see that they started the blog back in April 2013. Then it went on for a few months until the posts stopped throughout 2014, but it’s been back now since March. It’s great that they started it back up. It’s not uncommon for a business to launch a blog and then have things get so busy (in a good way) that it’s difficult to keep up. Now that they’ve been back they’ve been posting about 2-4 times per month. So that’s just about right in line with the weekly posts that we see with many business blogs. We recommend at least weekly. That will give you 50+ posts in a year, which is great for building the overall authority of the site while helping target clients with the questions they have relating to the industry. One thing you’ll notice right away on the CashStar blog is that they have multiple authors. I think that’s pretty cool. Many companies have built business blogs with multiple authors. This way readers can get used to that fact over the long-term and over time you can bring in new writers and still have the longtime writers write occasionally. I think an important thing to do, and CashStart might do this, is to have a content calendar. The calendar could be just a spreadsheet in Google Docs where the schedule for posts is kept with all the writers assigned to their post. It’s helpful to have the titles and ideas done separately. Otherwise the writer will see that it’s their turn to write a post and they’ll often struggle to think about what to write. But if the idea is already there they can roll with it. Categories and tags are great for helping readers navigate your blog posts. It’s just a way to obviously group similar posts so if someone is reading something they can find more post like it by looking at the category it’s in or the tags that the post has. Categories and tags are pretty similar. You can get away with using either. I’ve tried to differentiate them over the years, but people use them pretty much the same way. I just wanted to touch on this because I see that CashStar has the makings of a category list in their sidebar. I think that’s a good idea. It looks like they have a few different target clients and readers so categories can help people find the articles that would be most helpful for them. This is a really good post about how retailers can reach consumers via mobile. I like the topic: mobile. That’s a big item for marketers in both a retail setting and B2B setting. When you write about the topics your target clients care about most you give yourself a good chance of getting them to notice. The post is organized really well too. The setup starts with the mobile trend and how companies are creating apps. Then it shares two studies that setup the issue of engagement with apps. Then the post goes into tips for connecting with consumers on their mobile devices. That’s a great setup. It touches on the problem the reader is likely experience and then provides actionable advice on how they can solve that struggle. And it’s backed up with great studies to prove the point. Many people in business, especially executives, are thinking forward. They want to know what’s coming next. They also want to know how they should react. CashStar did a good job with this post on the future of barcodes. Or they might have been reading a few little articles about barcodes or maybe they heard it mentioned at a conference. So they search for information and come across this post. The post discusses what’s happening and what to expect and how to react. The executive reading it might develop their own thoughts, but they find posts like this one very useful. 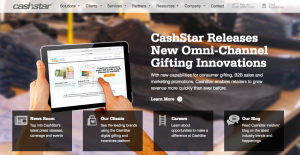 CashStar is doing great things with their business blog. It’s great that they’ve brought it back after missing out on a year. But that’s understandable for a company that’s been busy growing. I think CashStar has a lot of opportunity with their blog. They can write about the categories above and go into the things their target clients would be searching for online. I think it would be a great way to build the overall authority of their website, which will bring in new clients in the long-term.